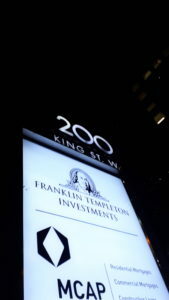 As my co-op work term comes to a bittersweet end at Franklin Templeton Investments Canada (FTI), I will be stepping away with more lessons learned than I could have imagined when I started this role four months ago. From collaborating with members of the analytics team and the sales group to job shadowing executives at different levels, FTI has given me the opportunity to experience many aspects of their business first-hand. During my time working with different teams across the company, the four key lessons that have resonated with me most are: confidence, listening, adaptability and company culture. Confidence is essential to any position in a company, but this lesson was really highlighted when I was job shadowing Liz Bouthillier, the Senior Vice President of Sales. With 14 years of sales experience under her belt, her confidence has played a major role in her career progression. Watching her work has inspired me to cultivate my own sense of confidence. Although I am a co-op student, I bring in a new perspective that can help drive sales, show opportunity costs and lead others. Now, whether I am providing analysis to the CEO or researching event venues, I strive to communicate my ideas with confidence. Another important skill that I’ve learned after job shadowing three members of the sales team is listening skills. I’ve learned that while you may have a lot of experience in your role and knowledge about your products, if you do not listen to the needs and wants of the client, you will never succeed in helping them. This skill becomes vital not only in sales, but in everyday life when working with others. I honed my listening skills by getting to the core needs of the client and asking questions that helped me fill information gaps. When working in any business, there will be difficult moments with internal teammates and external clients as you interact with various personalities. I found that being adaptable to the situation is key, especially in my role as a Sales, Strategy & Analytics co-op student. I work with many departments including marketing, strategic relations and events. By being adaptable, I can work with different types of personalities and switch gears quickly to redirect my focus to the needs of the department that I am working with. This characteristic was refined by my manager Melissa McGuire who manages strategic sales and analytics for FTI. Working alongside her, I gained experience on how to work with others and gained insight on how to keep my focus on the larger picture. Of all of the experiences I had and skills that I’ve learned, I think one of my biggest takeaways was the importance of company culture. To say that I had the opportunity to job shadow eight people at FTI, including the Senior Vice President of Sales, is a rare opportunity. And to say that I have worked with the CEO to increase attendance for our annual 2019 Market Outlook Event is an even rarer opportunity. All of these valuable opportunities have given me the chance to truly see what the company motto, “Reach For Better,” means to FTI. Striving to do better each day as a co-op student has allowed me to grow and hone my skills as a young professional. A special thank you goes to Duane Green, Dennis Tew, Erin Goodman and Zina Khan for launching FTI’s co-op program and for giving me the opportunity to be a co-op student there. I hope to pave the way for incoming students and encourage them to absorb all the skills and learning opportunities that FTI offers them. FTI will have a lot more openings for co-op students in the future and I hope to see you there!